Mir Amateur Radio SSTV Survives Dormant Period! SPACE STATION. Mir was unoccupied beginning August 27, 1999 until April 6, 2000. Many excellent pictures were received as Mir with the new crew orbited Earth over areas which included Australia and the United States. A few of these images are shown here. They are images within and outside the spacecraft. 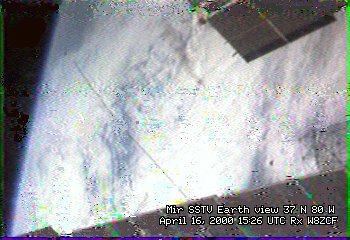 On April 16 the crew attached the camera to a window and were showing a series of Earth pictures at precisely 2 minute intervals as was activated by the SSTV Auto Controller as Mir orbited planet Earth. 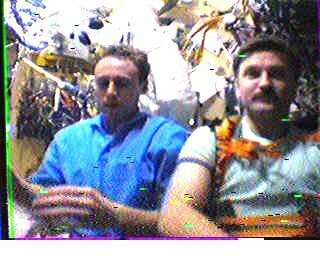 The SSTV System performed flawlessly when activated by the crew, as was expected, but had undergone a dormant period aboard Mir of nearly 8 months as referenced above. As reported by Chris van den Berg in his Mir News Report 477 the crew found the space ship in good standing, but noted "the fact that there was no dinner ready after their arrival . When in the past a new crew arrived, all was ready and that is very convenient"
This picture is typical of a series of pictures automatically taken which shows porions of Mir's solar panels and the Earth with clouds below. This was recorded by Farrell, W8ZCF, Cincinnati, Ohio, USA. This picture shows the Mir control room. (It is presumed Mir was on autopilot/computer control while the crew was attending other duties as none of the crew are visible). This was also received by W8ZCF. This picture was received by Tom, N3CXP, Allentown, Pennsylvania shows a picture of Flight Engineer Alex Kaleri, U8MIR. 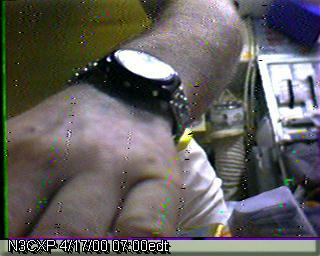 This picture also received by N3CXP, shows Alex's watch which he may have intended to show us "Mir time”, but unfortunately the face was obscured by reflected light. This picture was received by Murray, VK2KGM in Wiley Park (a suburb of Sydney) shows Commander Sergei Zalyotin on the left and Flight Engineer Alexander Kaleri on the right. Many messages flooded the Sarex and AMSAT internet bulletin boards as the crew activated the Amateur Radio equipment and began voice and video transmissions. It was great to have the recepients of Mir contacts share their excitement of initial QSOs for this latest Mir Mission 28. The earliest noted contacts came from "down under" in Australia and included contacts by George, VK2WEL, Grant, VK2TU, Doug, VK3TRD, BR Golla, VK2JAI and Derek, ZL1AKJ in Auckland. There were no doubt many other unreported contacts. There were also wav files of the actual voice contact made available. There was obvious real excitement in one of these. Apparently Alex, U8MIR had attempted to locate Maggie, VK3CFI via the Mir radio. Then apparently all Australia helped notify Maggie who was later successful in a documented excellent clear recording on a wav file. In one of the exchanges with Maggie, Alex discussed the beginning of his third stint on Mir and said, "For the first time, I arrived at the station which was unmanned hez lade” (without people). From what is learned at this writing in the third week of April the crew remains very busy with scheduled experiments including preparation for an EVA. At some later date a school schedule with a Q & A and including SSTV is planned, time permitting in the crews duties. The crew is to be greatly thanked for their taking time in their busy schedule to provide voice contact and the transmission of very exciting and informative pictures to us from outer space via the Mir Space Station. For those who would like to know how the Mir Amateur Radio SSTV System came into existence, it was conceived by Dr. Don Miller, W9NTP, Hank Cantrell, W4HTB, and Farrell Winder, W8ZCF. Dave Larsen, N6CO and Miles Mann, WF1F initiated and received approval for the system via Sergej Samburov, RV3DR. Miles arranged for the delivery of 3 of 4 systems to Russia and further journeyed to Russia to train the Cosmonauts in the operation of the equipment. 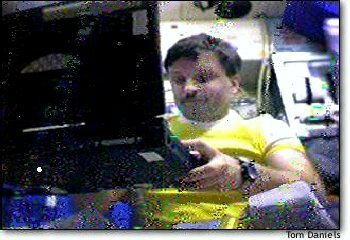 A new SSTV system utilizing a software approach as opposed to the hardware system now aboard Mir is being developed and completed by Jim Barber, N7CXI and is being tested and engineering assisted by the above group for consideration and possible use aboard the International Space station (ISS). A new QSL card is being prepared by MAREX-RU and MAREX-NA. It is expected that this card will be available sometime in June, 2000 to cover the requests of all those stations who have heard or have contacted the Mir Space Station during this current or past missions. Details will follow in various media as to contacts for these QSL cards.